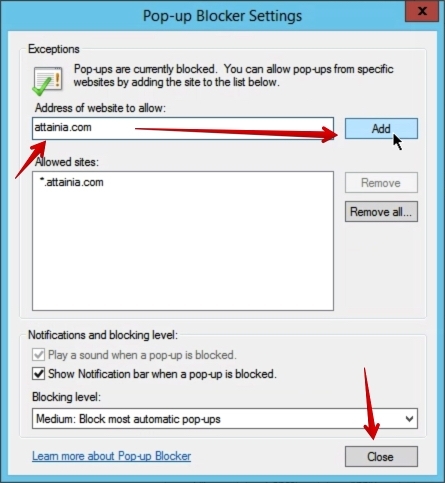 Attainia, Inc - ProductionFAQs FAQs - GeneralHow do I configure Internet Explorer? 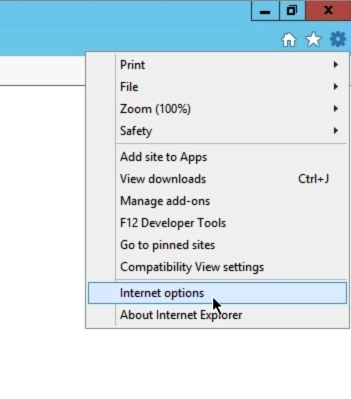 From within Internet Explorer, click on the Gear icon on the right corner of the menu bar, then select Internet Options. Once Internet Options appears, you will be under the General tab. 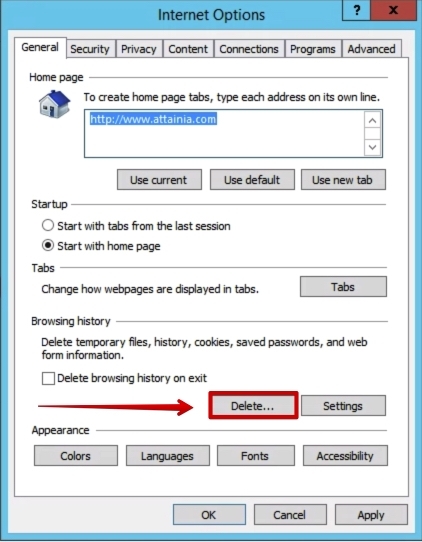 Click on the Delete... button under Browsing history. 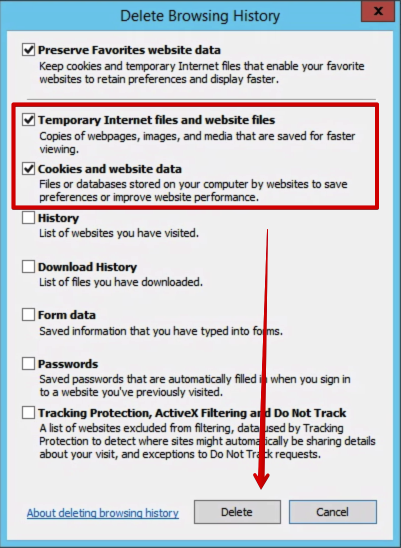 Check the boxes for Temporary Internet files, and Cookies and website data. If you have any of the Attainia sites saved in your Favorites or Bookmarks, UNcheck the box for Preserve Favorites website data. This will not remove your Favorites. It will only remove the temporary files associated with the sites in your Favorites. Now, back on the General tab, under Browsing history, click on the Settings button. Make sure Automatically is highlighted under Check for newer versions of stored pages. Now, on to the Security settings. Then, click on the Sites button. Remove the checkmark from Require server verification (https:) for all sites in this zone. Add the following to your trusted sites list by entering the website name in the empty textbox and clicking the Add button. Do this for each website address below. 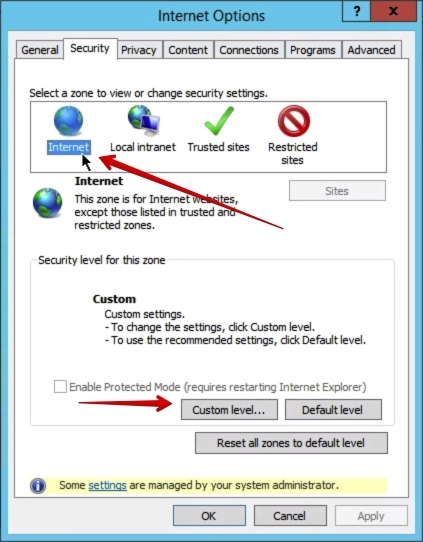 Back on the Security tab, ensure you are still under the Trusted sites zone. Then, click on the Custom level... button. Scroll down to under the Miscellaneous heading and find Display mixed content and set to Enable. 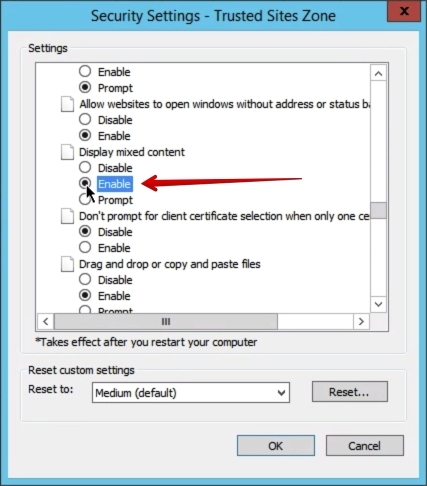 This setting prevents the pop up window 'Do you wants to display unsecure items?' Answering Yes or No to that window kicks you out of Attainia. 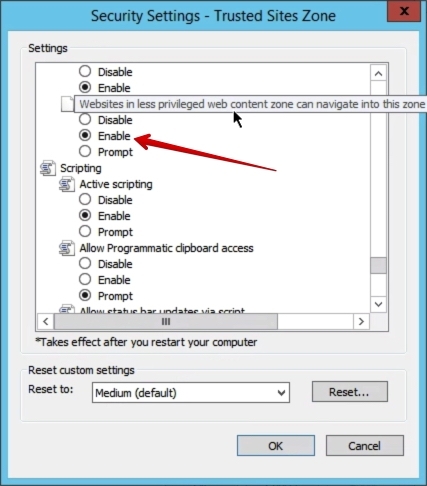 Scroll down a little farther under the Miscellaneous heading and find Websites in less priviliged web content zone can navigate into this zone and set it to Enable. 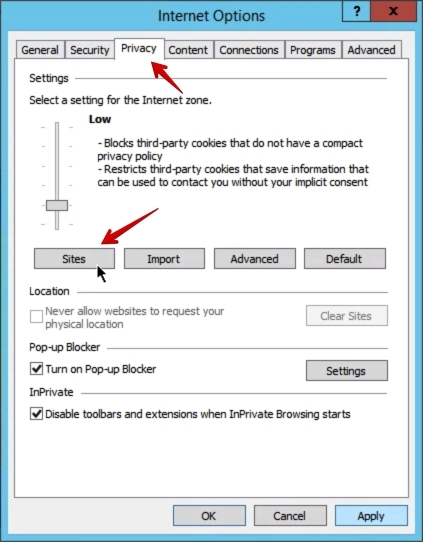 This setting prevents an annoying warning when navigating to a site in your Trusted Sites list from a site that is not in the Trusted Sites list. Click on Custom level... button. Apply the same settings outlined in Steps 9 and 10 from this guide. 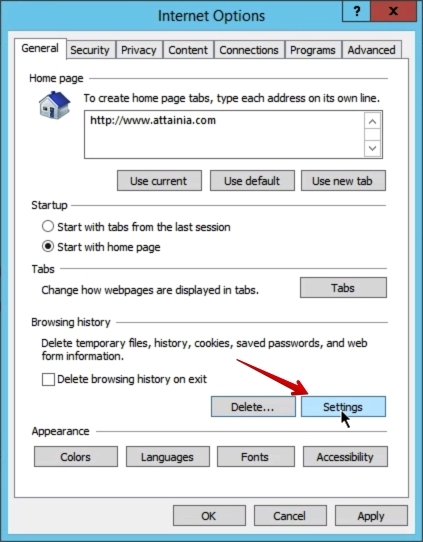 In the empty textbox, enter attainia.com, then click on Allow button. You will see the site added to the Managed websites area below. 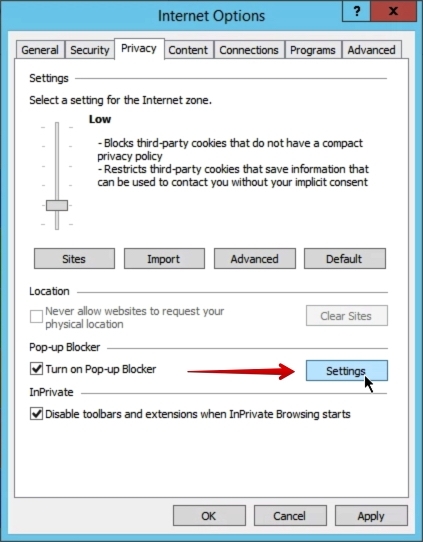 Back on the Privacy tab, click on Settings... under the Pop-up Blocker area. In the text box under Address of website to allow, type attainia.com then click Add. You should see the site added to the list of sites under the Allowed sites area. Step 16 - You're finished! 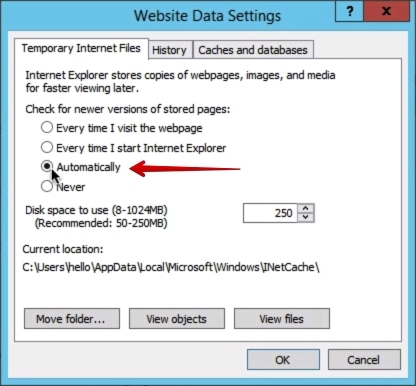 Be sure to exit all Internet Explorer browsers for the settings to take effect. Then restart Internet Explorer.